December Events Archives - Art Matters! Rogue Gallery Celebrates the Holidays! Rogue Gallery celebrates the holidays with a special Third Friday Event: Exhibit Reception, Christmas Carolers, and a Book Signing! Christmas Caroling: Pat O’Scannell and members of the ‘More Fools Than Wise’ madrigal group will be singing Christmas carols beginning at 5:30 pm. Peggy Dover Book Signing: Enjoy a special meet and greet with local author and Mail Tribune columnist, Peggy Dover. Dover’s new book, “Trips & Tangents: 101 Favorite Southern Oregon Journal Columns,” is packed with entertaining vignettes about local people/places/events and makes a great Christmas gift. Peggy will be at the gallery from 5-7 p.m. 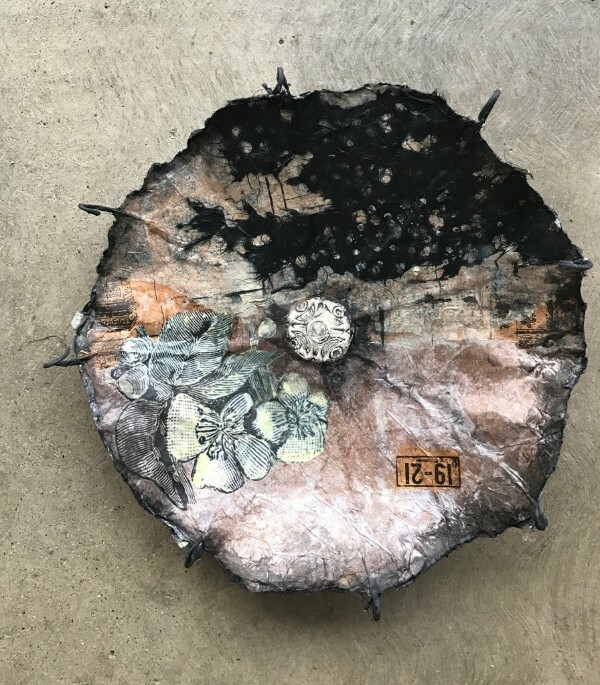 The Annual Members’ Exhibition features work by Rogue Gallery and Art Center members, and is always one of the most popular of the year. The Rogue Gallery has had a long history of supporting local and regional artists. This exhibit gives Rogue Gallery members an opportunity to exhibit one piece of their work on the central theme of “Don’t Fence Me In”. Over 80 artists are participating in this non-juried exhibit. Artists submitted artwork that reflects their personal interpretation of the theme. The exhibit includes watercolors, acrylic, and oil paintings as well as sculptures, photography, collage, and pastels. 11 a.m. to 3 p.m.Call (541)772-8118 for more info or visit www.roguegallery.org. Bittersweet: Yosemite 20 years Later. Bobbi Murphy’s new show, Bittersweet: Yosemite 20 Years Later, opens on Friday, December 7th at The Photographers’ Gallery At The Ashland Art Center and will run through January. Yosemite holds wonderful memories for me – of autumn walks in golden meadows and full moon nights along the Merced River listening to great horned owls call to their families on cold evenings. Tramping through spring meadows flooded with snow runoff, riotous with wild flowers. John Muir walked here and helped create America’s second great National Park. There is no denying the impact of climate change on the park: drought, fire, pine beetles have killed 129 million trees in California and Yosemite has not been spared. It is heartbreaking to see and experience while remembering how magnificent it was just a few short years ago. But the tourists come in crowds greater than ever. Despite all that we have done to it, Yosemite is still a glorious, spectacular place that makes a heart sing, even in the midst of destruction and devastation. We are loving it to death and yet, somehow don’t love it enough to save it and ourselves. Help a local child and celebrate the Holiday’s by donating to Ashland Art Center’s Giving Tree. 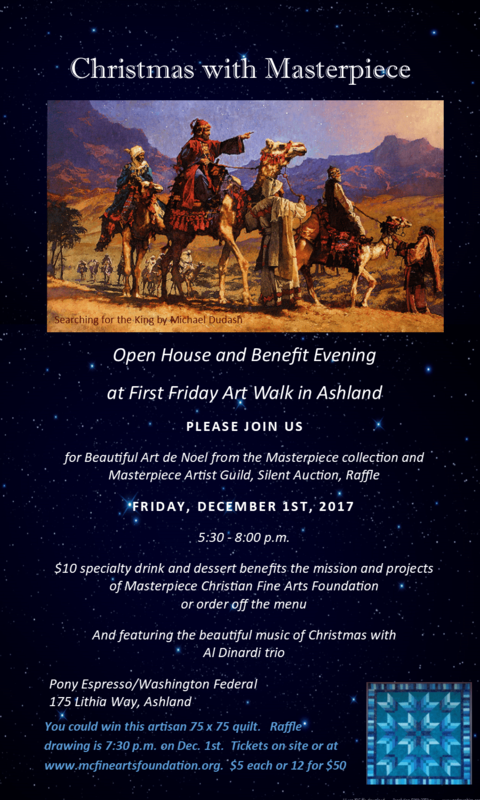 December First Friday will be packed with excitement at Ashland Art Center. We will be kicking off our First Friday Weekend Sale, 10% off, December 7, 8 & 9th. Handcrafted work by local artists will include: paintings; photography; prints; jewelry; scarves; fiber art; woodwork; ceramics. Shop, enjoy wine and music and help a child in need! We hope will you join us and spread some holiday cheer. Gallerie Karon’s December show features all of our artists with gifts for the holidays. Let us be your personal shopper – bring your list – we’re here to help. The biggest news is that Gallerie Karon is expanding! Our new addition, “The Feathered Wing”, will be open by the holidays! In this new area, accessible through our main gallery, is a two-part section. The first is full of small, multiple use furniture pieces for smaller spaces. The second is a special area for Oriental furniture and accessories with larger scale antique Buddhas and Quan Yins. It’s a serene room far away from today’s problems and filled with things that you can use to create your own serene space at home. We’ll have a Grand Opening once the expansion is completed, but the move is on! Nora Costley, Watercolorist, shares her artistic evolution through self-discovery and the mystery of the universe. Nora is a world traveler and holds a BA in Fine Art from the University of New Mexico. Her work has been displayed in the National Museum of Art in Washington, DC. She currently resides in the Rogue Valley. She enjoys many forms of art including sculpture, traditional pottery making in Japan, Installation and Photography. Even as a watercolorist, Nora feels an artist does not need to stick with the same subject or medium. She prefers an artist’s creation to reflect the transient beings they are, and continue to demand an evolution as individuals. She states…”for me art is a constant exploration and experimentation of self and the universe, which parallels the exploration of medium and processes.” Also…”a driving force is art that stimulates personal power and freedom in myself and others.” Her practice has evolved from that of discovering and resolving the internal, to decoding the world at large. Often her ideas flow, and it’s not until a piece is complete, that it either is understood or not. The universe is of great curiosity to her, but as with Nora’s artistic endeavor, she is satisfied with the mystery. Our Holiday Market is moving to the Medford Armory after 13 seasons with the Art Wing at Briscoe Elementary in Ashland. For 2018, we plan to host over 60 artisans at this new location, featuring some of the finest locally crafted gifts you’ll find. Enjoy live music, a family-friendly atmosphere and a chance to support local artisans while shopping for one-of-a-kind gifts. A raffle drawing will be held on Sunday afternoon at both of our holiday events. The winner receives a $100 gift certificate. This Holiday Season Support Local Handmade. Join Us! Please see the attached “Spotlight Exhibits” and December Gallery Tour Map. at Evergreen Federal Bank’s Bear Hotel, 2101 NE Spaulding Ave, Grants Pass. The public is invited to view holiday trees, art displays, and The Southern Oregon Adventure at Evergreen’s Bear Hotel. Visit Santa and Mrs. Claus; participate in fun family games and activities like the Home Depot Kid’s Workshop project; enjoy live entertainment; and vote for the People’s Choice Award. Learn Zentangle designs with certified Zentangle instructor, Cindy Hernandez. Then create fun and flexible 3D art with them. Zentangle is a creative doodling process where there are no mistakes, and fantastic looking designs are easily repeatable. These move!! Check out our video on Facebook. Learn about the life, and paintings and murals of Mexican artist Diego Rivera. We will copy one of his work’s onto a 8″ x 10″ canvas. Class is taught with Golden’s Heavy Body acrylics. This class is designed for the student who wants to excel at portraiture. This class is filled with many lectures and demonstrations on becoming a fine art portrait artist, including and not limited to: eyes, noses, mouths, ears, skin color, bone structure, hair, hands, limbs, torsos, clothing, and backgrounds. Bobbi works individually with all students on the level they are as well as working with the group on areas that I see are needed for everyone. It is a great class for whoever you are and at whatever level you are at. This is going to be from a live model. All mediums are welcome (except oil paint). Learn techniques to create realistic clouds, in a variety of lighting circumstances. We will explore how to use clouds to show what time of day it is, and how to create consistent light within a painting or drawing. Class is taught in acrylic. Photos by Marta! Aren’t Southern Oregon clouds amazing! She has taken these photos in preparation for the class. We are going to use these two photos for some exercises. Thanks Marta! Our next classes will start late January. We are scheduling for Winter/Spring now. Please let us know if you have a great idea for a class! This class will work from a still life. We will study the effects of light and shadow, exploring the temperatures of light and how lights influence what we paint. It is a must have class for all artists. Bobbi will describe and demonstrate the anatomy of light and shadow. The color theory class you’ve been asking for! This class is all about learning the color wheel, and we will create mixing charge so that you can learn how to explore color on your own. One of Canada’s most loved artists. Emily Carr has been compared to Georgia O’Keeffe, Edvard Munch, and Vincent van Gogh. She dedicated her life to painting powerful landscapes of British Colombia. We will learn about her life, artwork, and style and copy one of her work’s (of your choice). Class is taught with Golden’s Heavy Body acrylics. Dragons & Dinos – Oh my! A needlefelting workshop where you can create a dragon or dinosaur. We will create whimsical dragons or real beasts as we explore working with armatures in this workshop. Some experience needlefelting is recommended by not required. Adults and kids 8 and up are welcome. Preregistration is required. The Museum will have a book sale during our Open Studios Preview exhibition from Sept 18 – 27. We highly encourage you to come see our event preview, get a ticket to explore artist studios, and pick up a few books. We have many art how-to books along with other art books for sale. Open Studios: Sat. 9/29 & Sun 9/30. $20 ticket. See 13 artists in 10 locations and see how they create their art. 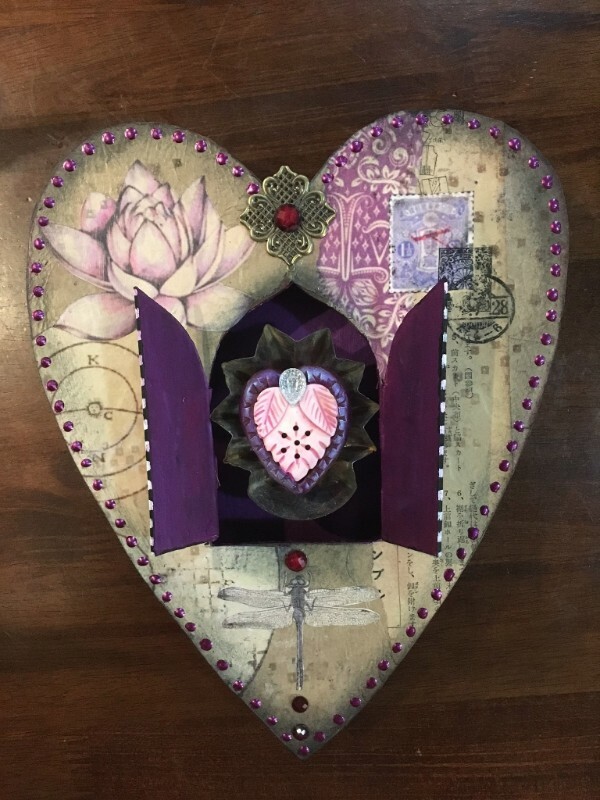 Exciting new classes by Cathy Dorris are now available at Kindred Spirits. You can come sign-up on location during regular business hours or register online at our website. Materials will be provided for each person and food and beverages will be available for purchase on site. One glass of red or white house wine will be included with your class sign-up. Cathy makes this experience easy to follow and entertaining for each student. These classes fill up quickly so don’t miss out on the fun. Copyright © 2017 Cathy Dorris Studios, All rights reserved. Open Holiday Studio and New Seasonal Classes at LightGarden Glass Art! This time of year we are especially appreciative of our friends that visit us throughout the year as well as those who will come into our lives in the future. Join us for a celebration of the holidays with our Holiday Open Studio. 10 – 12n. Please call or email ahead to reserve your space. Here’s a great little project for learning to paint with glass enamels. Make either the spoon rest or the small platter. Place your glass right over the pattern and paint the top layer, watercolor the bottom layer. All materials and firing included. Minimal glass cutting, use up your clear scrap glass. Includes instruction and project sheet, clear base glass and two firings. Come join our morning workshops on Wednesday and Saturday mornings from 10a – Noon. Use our tools and workshop space. $10 for 2 hours! Call to reserve your space. 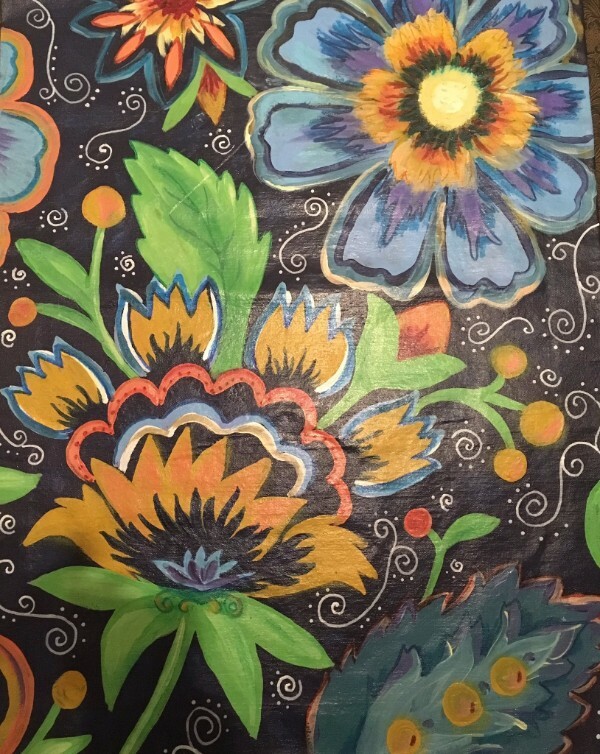 You can do a Flowers of Hope panel during any of our workshops…or a “Try Fusing” panel to get you started in fusing. You can also schedule bigger projects. Contact us for more information.